Reef Group specialise in sea container transport and are committed to providing the safest method of 20ft container transport via tilt tray using our container loading and offloading system (CLOS). We can ensure that your 20ft sea container will be loaded and unloaded smoothly via our Tilt Tray Slide vehicles with a maximum tilt of only 12 degrees. These trucks can carry 20ft, 10ft, 8ft and 6ft sea containers up to a maximum of 10 tonnes. Should your container weigh over 10 tonnes our Semi Side Loaders are able to transport 20ft and 40ft sea containers and are permitted to carry up to a maximum weight of 30 tonnes. The side loader arms load and unload to the driver’s side and are also capable of double stacking sea containers on site if required. If you are looking for bulk container transport and have your own loading and unloading facilities our Low Loaders are a great low cost option capable of carrying two 20ft containers or one 40ft container. Sometimes your container may need to go in a hard to reach location and this is where our Hiab Crane Truck comes in handy. Suitable for 20ft/40ft containers weighing up to 6.5 tonnes and also have trailers available for transporting multiple loads. 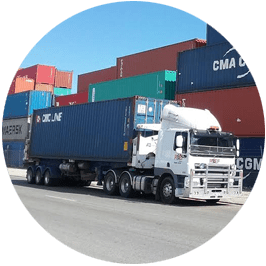 We offer container transport all over Perth metro and WA Country including Albany, Bunbury, Busselton, Esperance, Geraldton, Kalgoorlie, Manjimup, Port Hedland and more. All of our drivers are Perth Rail inducted and we have MSIC access to the Fremantle Wharf and Ports. Unsure which truck you need? Download our Transport Guide for vehicle load capacities. Check out the video below for footage of a sea container transport.